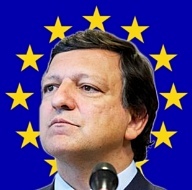 Bloggers4UKIP: Barroso tells BBC it could be impossible for Scotland to join the EU. Barroso tells BBC it could be impossible for Scotland to join the EU. Emperor Barroso has told the BBC that it would be "extremely difficult, if not impossible" for Scotland to become a member of the EU if it declares independence from the UK. The SNP's stance on the EU is frankly bizarre - they want to swap a British union dominated by Scots and Scottish interests for a European Union in which it would be a tiny, insignificant voice. Despite being told several times that their belief that they will automatically be given EU membership is incorrect, they continue to plan for a future in which Scotland breezes into the EU and nobody makes them join the €uro. Personally, I would be happy to see Scotland declare independence. The Scottish people never wanted union with England in the first place and they never took to Britishness the way the English did. The relationship between the two countries has always been strained with the 700 year old Battle of Bannockburn being invoked in most "debates" about Anglo-Scottish relations as if it was still a raw wound. The battle for independence should be won honestly though, not by bluff and bluster which is what the SNP is coming out with now. As the independence referendum gets closer, the wheels are coming off the SNP's wagon. The Tories, Labour and Lib Dems have all pledged to block any currency union with Scotland which was one of Alex Salmond's key pledges for an independent Scotland along with EU membership, a budget surplus, not taking on a share of the British national debt and some other pie in the sky stuff. Most Scots know they can't afford independence even if they want it and the SNP's habit of making promises it can't keep won't help change their minds.